So says the headline of the latest UNITY leaflet produced by Socialist Worker. (Click here to download). Kicking up a fuss is what the union movement needs to do in opposition to National's anti-worker laws. The rallies in Auckland, Wellington. Christchurch and Dunedin were the first round of a hopefully ongoing union campaign (more info at http://fairness.org.nz/). 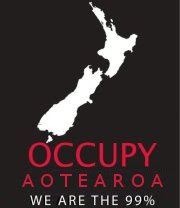 The Council of Trade Unions (CTU), which brings together most New Zealand unions, is playing a leading role in mobilising opposition to the law changes. National's attacks on workers' rights are part and parcel with their commitment to neoliberal economic policies. Since the 1980s government efforts to weaken workers' collective power have gone hand-in-hand with privatisation, financial deregulation and changes to the tax system that have favoured the rich. The result: massive income inequality and generational poverty. We desperately need a change of economic direction. And that’s what a new document drafted by the CTU potentially offers. The CTU's ‘Alternative Economic Strategy' is a fundamental rejection of neoliberal policies. 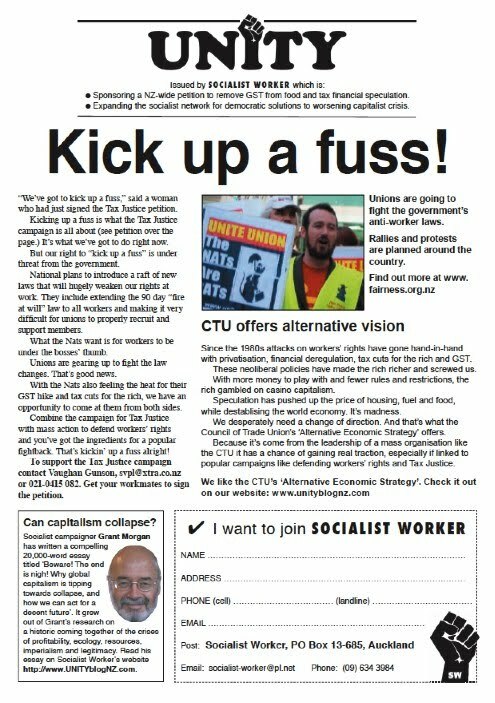 Because the strategy document has come from the leadership of a mass organisation like the CTU it has a chance of gaining traction in the real world, especially - as our UNITY leaflet argues - if it's linked to popular campaigns like defending workers’ rights and Tax Justice. Click here to download the petition. We want the campaign to take off in a big way. To do that we need to broaden the people and organisations actively involved. We are very interested in support from unions and unionists. This campaign could link up with the union mobilisations against National's attacks on workers. As we say in our leaflet: "[W]e have an opportunity to come at them from both sides. Combine the campaign for Tax Justice with mass action to defend workers’ rights and you’ve got the ingredients for a popular fightback." That would certainly be kicking up a fuss, which is what the times demand. Most serious economic commentators (from a variety of political perspectives) recognise that the world economy has entered a period of prolonged crisis which it might be impossible to stabilise. The world's resources are fast being depleted, which will send forth massive economic shock-waves. While the urgency of the climate change threat weighs heavily on us all. The extent of the threats facing humanity are analysed in Grant Morgan's compelling essay 'Beware! The end is nigh! 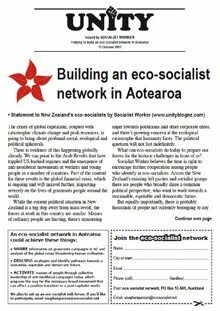 ': Why global capitalism is tipping towards collapse, and how we can act for a decent future advertised in our leaflet. The sobering realities of a world in crisis and transition requires us to organise collectively today to help secure a future. 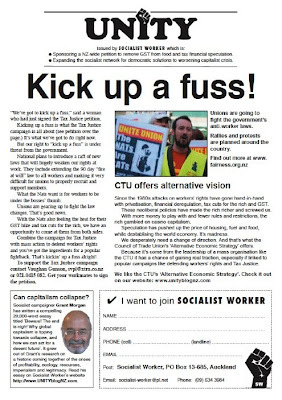 Socialist Worker believes popular campaigns targeting neo-liberalism, which are linked to the holistic economic alternative that is the essence of the CTU's strategy, presents us with a way forward. We welcome feedback on the ideas raised in our UNITY leaflet. Please circulate it and the Tax Justice petition to your union contacts. 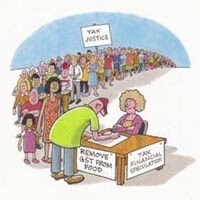 If you would like to give support to the Tax Justice campaign get in touch with me now.